Although his granddaddy was a former master distiller, Jack Daniel’s assistant master distiller Chris Fletcher was influenced more by ‘80s secret agent MacGyver. He spoke to Becky Paskin about life in Lynchburg, long toasts and the mysteries of charcoal mellowing. ‘There’s an old TV show called MacGyver I used to watch a lot as a kid. He would find himself in these situations, like he’d get trapped in a vault somewhere but he’d find bubble gum and peanut butter and mix them together and blow up the vault and escape. I’d say I watched too much MacGyver as a kid figuring out how he did that kind of stuff. So I enjoyed science, chemistry especially. ‘My formal education was in chemistry and my grandfather also studied it. We are the only two chemists in the family. People think because I studied chemistry it was always my goal to be a distiller, and it absolutely was not. I had no idea what I wanted to do. ‘I grew up in Lynchburg, Tennessee, born and raised. My grandfather [Frank Bobo] was the master distiller of Jack Daniel’s for many years – he started working there in 1957, and retired in 1989 as master distiller. I was around the distillery when I was young, even though I didn’t know what a distillery was, just spending time with my granddad. ‘My office is his old office, and they even saved me the desk that he had. He’s 89 now, but he can still remember a setting on a still, or the time or a temperature. It’s amazing what he can pull up from his memory, so to have that kind of experience just a phone call away is pretty cool. ‘My first job was as a tour guide. People come from all over the world to Lynchburg to see Jack Daniel’s – they plan their vacations around coming to the US and they visit New York and Las Vegas, then they make sure to come to Lynchburg. I mean wow, that’s so powerful. ‘Jack Daniel’s is the largest employer in our county – we only have about 600 people in the city of Lynchburg, and most people had relatives that worked at the distillery. ‘The families of Lynchburg really take a lot of pride in making Jack Daniel’s. It’s a piece of Lynchburg and we’re sending it to 170 countries, so people, whether they work in bottling, or warehousing, or in the distillery, there’s really and truly this sense of “this is our town, this is our home, and we take a lot of pride making this product”. ‘Being such a small community, the connection that the employees have with their own history with the distillery creates that pride, and certainly quality control. Jeff and I get a lot of credit but we have, honestly, some of the most talented people in the industry. We employ at least 500 people, so we’re by far the number one employer in the county. It’s really a cool thing, there’s literally generations of families that have worked there. ‘Moore is a dry county, so you can drink there but you just can’t buy alcohol. There are no bars, no restaurants where you can get a drink. You can buy a bottle at our gift shop but that’s it – that’s the only spirits at all sold in the county. It’s pretty unusual but then again there’s a lot of people who work in the distillery who choose not to drink, and that’s fine too. ‘How do people resonate with the brand? It’s different for different people, but music is a big one. People connect with it, the Frank Sinatra connection for instance. Frank loved our product, and he was kind of the first rock star, right? We never paid him, he just loves Jack Daniel’s and that kind of authentic bond that was created resonates with people, because it’s real. ‘I’m a music fan; of course being near Nashville I have a big thing for songwriters and people who write all their own music. I was able to meet Robert Earl Keen, a Texas singer-songwriter, one time at a show in Birmingham, Alabama, which was awesome because he’s one of my heroes. It was pretty cool to meet him, I was probably just fumbling all over myself, I got him to sign my songbook for me, and my wife was taking pictures, it was really, really cool. 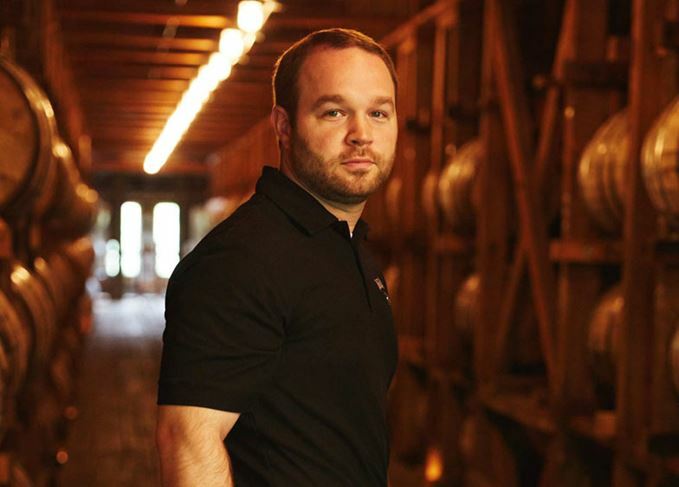 ‘Jeff [Arnett, master distiller at Jack Daniel’s], really cares a lot about the distillery, and we both feel this sense of responsibility of being the guys wearing the shirt – it’s the Jack Daniel name on the shirt; it’s not mine and Jeff would say it’s not his. Being respectful of that, that’s number one for Jeff. He’s really truly a great person. ‘To be Jeff’s successor would be a dream job for me, but it’s a dream job for a lot of people. I have still got a lot to learn, I’m very fortunate to be in this role, but I will not be the only one to be considered, I’m sure of that. ‘The distillery was founded in 1866, and so balancing that tradition with innovation is something that obviously we spend a lot of time thinking about. ‘I’ve not looked at a Tabasco finish like George Dickel. We do a lot of different things with product development, everything from rye whiskey to our flavoured line with Tennessee Fire and the honey, which have been greatly successful. ‘We’ve done so many different experiments with barrels – big and small, different toasts, different chars. We’ve even flipped barrels inside out and wrong side out, and retoasted and recharred them. It didn’t hold well, but that’s the kind of stuff that over the last 50 years we’ve looked at. ‘Our barrels usually have a 17-minute toast with a char of about 25-30 seconds, which puts a really deep char on it. With the Jack Daniel’s 150th Anniversary whiskey, we wanted to do something a little different, so we utilised a heavier toast of 34 minutes, with just a flash char. Because Tennessee whiskey has to be in a charred oak barrel by law, we barely put a little char on there because we double that toast time. ‘You’re trying to get that nice brown-red layer of caramelised sugars that impart that rich, sweet tone to the whiskey. The idea was that 150 years ago they would have been trying to char a barrel by hand, and probably with more of a toast than a char. Nowadays we’re able to control it to the second, along with the heat and the intensity. ‘We also lowered the entry proof to 100 (50% abv), because if you are trying to get at those natural wood sugars, more of that is going to dissolve in water than alcohol. So by lowering the entry proof for that product, hopefully you’re going to maximise the extraction of those natural wood sugars that you want to get at, that that double toast provides. The result is this toasted marshmallow, butterscotch sweet note that’s so good. ‘We still charcoal mellow our whiskey, but our rye whiskey is mellowed a bit differently. The charcoal is good at absorbing a lot of the corn flavour, and our rye whiskey is only 18% corn, so there’s not a lot of that for the charcoal to work with. Charcoal mellowing is not a one-size-fits-all thing. ‘I wish I could tell you we’ve got this chemical instrument in the lab and we can tell exactly you why that is, but we don’t. There’s hardly anything that we can measure analytically that tells us what charcoal mellowing does, aside from remove a lot of that corn oil flavour.